The School Loop mobile app keeps parents and students in the loop when it comes to current assignments, grades, LoopMail messages, and more. Faculty and staff can use the app to send and receive LoopMail messages and check the news. Available for both iPhone and Android phones in the U.S. only. All current assignments are listed in a scrollable view. Tap any assignment tile for full details. Use your mobile device to view and reply to all of your inbox LoopMail messages. You may also send LoopMail to the Learning Management Team or your teachers. At a glance, view the current grade for each course. 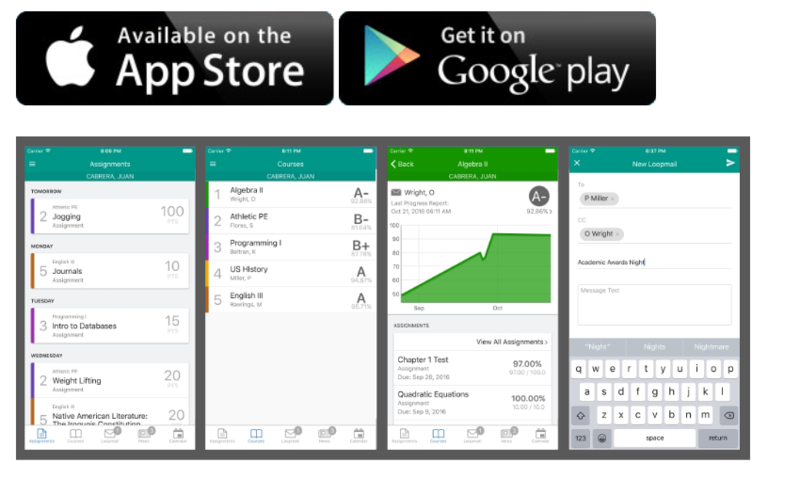 Tap any course to view your grade progress graph, list of assignments, assignments with a score of zero, and recently scored assignments. All the current news published for you. Tap any news title to view its details. Basic list of events for now with upgrades planned for the near future. Parents can add multiple students to their app — even students from different schools! Tap the 3 horizontal bars in the upper left corner. If you have a student at a different school, you can tap the button and select the school (You must have a registered parent account at both schools). Enter the student ID# and initials and tap the Add button. If your school sends attendance data, you'll see the same table of attendance that you see online today.